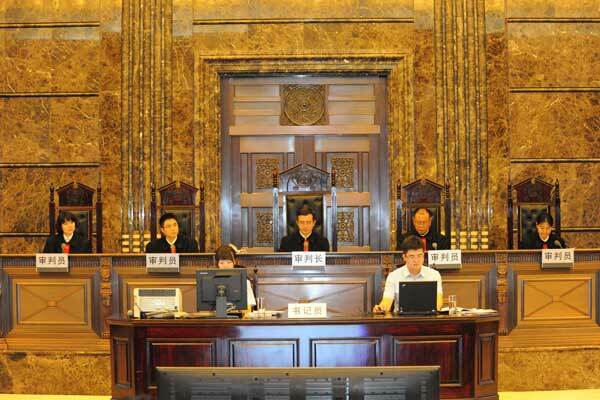 On June 11, the 4th Civil Chamber of the Supreme People’s Court (Court) held a public hearing in the case of Sino-Environment Technology Group vs. Thumb Environmental Technology Group (Thumb Env-Tech). 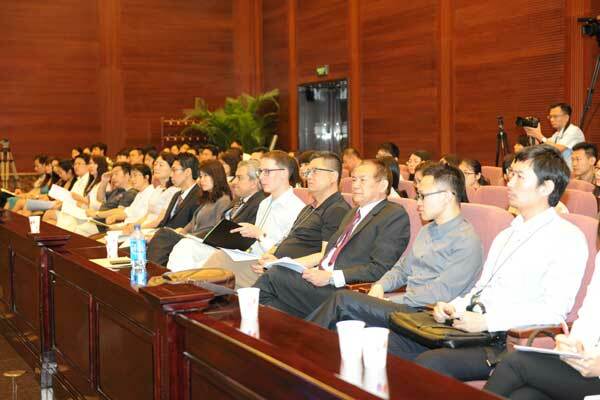 Nils Pelzer [seen in the audience in the photo below], research fellow at the Max Planck Institute Luxembourg and visiting scholar at the KoGuan Law School of Shanghai Jiaotong University, attended the hearing. The Supreme People’s Court Observer made it possible. A slightly amended version of his report follows. This hearing was the latest of a series of lawsuits between the parties. The earlier blogpost on this case (linked here) concerned a related lawsuit between the parties but the Fujian Higher Court decision in the current case was not available on-line. Thumb Env-Tech is a Chinese wholly-owned subsidiary of Sino-Environment Tech, a company registered in Singapore (now in liquidation). The Singaporean liquidator (the former judicial manager) had dismissed the former management board of Thumb Env-Tech and appointed the insolvency firm’s own managing partner as the new chairman of the board of directors (and legal representative). The liquidator had also decided to reduce the registered capital of Thumb Env-Tech. However, because Thumb Env-Tech’s old management did not comply with the directives of new management, these measures were not registered with the local Administration of Industry and Commerce (AIC) Bureau. Thumb Env-Tech’s original management – on behalf of Thumb Env-Tech – sued the parent company in the Fujian Higher People’s Court to pay a capital contribution of RMB 45 million (approximately USD 7.23 million), ignoring both their own removal and the order to implement the capital reduction and challenged the right of the judicial manager (later the liquidator), appointed by the Singapore High Court, to remove the original legal representative and directors. Thumb Env-Tech alleged that the judicial manager had no right to remove the directors and legal representative. Thumb’s new legal representative, on the other hand, filed a motion to withdraw the lawsuit. Sino-Environment Tech put forward the argument because of the lack of power of representation, filing the lawsuit was not the “real declaration of intention” of Thumb Env-Tech. Surprisingly in the first instance, the Fujian Higher People’s Court decided in favor of Thumb, ordering Sino-Environment Tech to pay the full sum of RMB 45 million. The court reasoned that Sino-Environment Tech was unable to prove that the old management board, which was still officially registered and had used the official company stamp, had no power of representation. On appeal by Sino-Environment Tech, the Court (unanimously) rejected this argument in the second and final instance. The Court decided that while the registration with the AIC was sufficient to file a lawsuit on behalf of the company, things have to be treated differently when it comes to the substantial claim of the subsidiary against its parent company. The aim of the AIC registry is to protect third parties acting in good faith, but this does not apply to the internal relationship between a company and its shareholders. There, the real situation overrides the good-faith protection of the registry. Even more importantly, the Court expressly recognized the power of the Singaporean liquidator to represent the parent company in liquidation. As far as the foreign liquidator’s powers are concerned, the Court ruled that the law of the place of the registered office of the relevant company is applicable. This outcome had been expected by both Chinese and foreign legal experts. Not only does it clarify that just possessing a chop and an official registration does not always come along with absolute authority, but it is also a step towards to insolvency rules in China consistent with uniform international insolvency rules in China. Further, if the Court had upheld the ruling of the first instance, this would have basically meant that parent companies might completely lose control over their Chinese subsidiaries. From this point of view, the ruling strengthened the investment environment in China. From a political perspective, this case might mark the beginning of a more open attitude to grant access to court hearings to foreigners. As reported by Chinese newspapers, this was the first hearing of the Court that foreign diplomats were explicitly invited to attend. Lastly, the similarities of a hearing of the Court and of Western supreme courts were striking (at least in this case). The proceedings were skilfully led by Judge Luo Dongchuan [chief judge of the 4th Civil Chamber], and the quality of the debate between the Court and the lawyers of both parties was generally very high. It is not only for this reason that the 4th Civil Chamber will probably submit the case as a suggestion for a new guiding case.